Reports allege that NBC is refusing to allow the word "abortion" on air. It’s been more than 40 years since abortion was legalized – it’s about time television caught up. If you agree, add your name to our letter to NBC now. 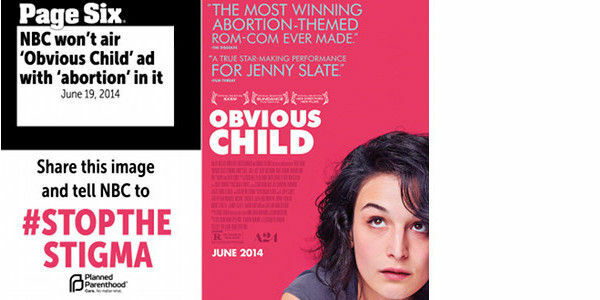 Here’s the scoop: NBC reportedly refused to run an ad for the romantic comedy Obvious Child because the ad included the word "abortion," with sources saying that they found the "subject matter was inappropriate for viewers. It’s outrageous that a major network would choose to censor mentions about abortion. For far too long, the refusal to talk honestly about abortion has led to increasing stigma around the issue, and it’s got to stop. Three in ten women will have an abortion by age 45. And the vast majority of Americans support access to safe and legal abortion. If NBC, is censoring the use of the word "abortion," then the network is refusing to even take part in a conversation, let alone an honest one that accurately reflects women’s lives. Tell NBCUniversal CEO Stephen B. Burke to #StoptheStigma and lead an honest, accurate conversation about abortion. I'm outraged to read reports that NBC has refused to even mentions of the word "abortion" on air. Censoring the word increases stigma and disrespects women’s choices. Safe and legal abortion is supported by a vast majority of Americans - including me. We do not see the mere mention of "abortion" as inappropriate on network television. I urge you and your network to allow the word "abortion" on air and to lead a conversation that would reduce stigma for the three in ten women who will have an abortion by age 45.